Children are curious about the world around them. Let’s teach them about how similar we all are and that differences are a good thing. CISS has Educational Dolls Kits that come with a comprehensive binder where educators and providers will find detailed suggestions for every routines and transitions. Although your program may not currently be supporting a child with a specific diagnosis, may we suggest that you make use of the doll kits in your daily programming to promote diversity. 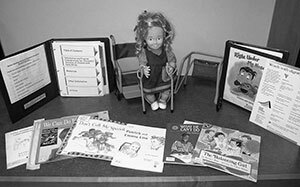 The following are examples of how a child care program may set up their environment with the contents from an Educational Doll Kit. The Doll Kit chosen is Lin – Autism Spectrum Disorder. With infants and toddlers, a low table or sensory bin can display the quilted sensory mat, the squeezy toys, and the sensory dot ball. In the quiet area, the move and sit cushion can be on the floor for the children to crawl over, lie on or sit on top of. The weighted purple dolphin can be explored during group time where descriptive vocabulary can be introduced (heavy, soft, squishy). Lin the doll can be swaddled, cradled and sung to. With preschoolers, Lin the doll can be introduced at circle time. Discussions can include similarities and differences in how we all move our bodies, how learning new movements may be easier for some and more difficult for others. Different movements can be experienced by playing Simon Says. Story time can include one of the many age appropriate books that are included in the kit. In the quiet corner the weighted dolphin and sensory toys can be available to help calm an upset child. A social game such as Red Light/Green Light can be played using the stop and go visuals. The toileting and hand washing visuals can be posted in the bathroom. In addition to using some of the preschool ideas, Kinders can use the spring loaded scissors during art activities. The children can access the fidget toys during group time or quiet time. The educator/provider can read, “A is for Autism, F is for Friend” and “Taking Autism to School.” Discussions to follow can be about the similarities and differences in how we make and keep friends or in how we all use language to communicate with each other. Even if the language used is sign or pictures. For School Age children, the kit contains several excellent books that can be on the book shelf or read a chapter at a time. The DVD “Experience Autism” allows children to experience what it may be like to live with Autism through five simulation activities. These activities help children appreciate differences. Dramatic play can be set up to further explore the activities viewed. Making the kits available in natural environments can support children to learn, experience and feel comfortable with differences. Please contact your Resource Consultant or the CISS office at ciss@afchildcare.on.ca or 613-736-1913 ext. 284 to borrow the kits. This entry was posted in Children with Special Needs, Early Learning and Care, Educators / Providers, Inclusion, Programming Ideas, Resources on September 3, 2014 by cissnewsletter.